Midfielder Ryan McCord has switched from Alloa Athletic to Raith Rovers, signing a one-year contract with the Kirkcaldy club. 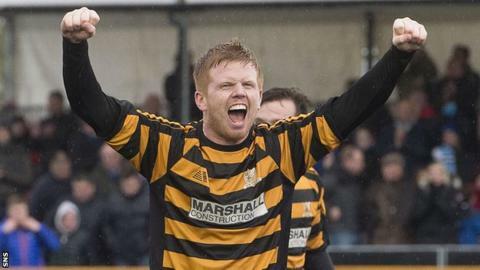 The 26-year-old joined Alloa after leaving Dundee United in 2011 and has made 161 appearances for the Wasps. New Rovers manager Ray McKinnon said: "Ryan is an outstanding technical football player. "He's an intelligent passer of the ball and will really suit the style I want us to play." McKinnon thought that McCord would benefit from the switch to full-time training at Stark's Park from their Scottish Championship rivals. The 19-year-old Darren Petrie had already been recruited from Dundee United. The Rovers manager is seeking new midfield recruits after Ryan Conroy joined Queen of the South, Liam Fox left for a coaching role at Hearts, while Martin Scott, Kevin Moon and Liam McCroary were released. Strikers Calum Elliot and Christian Nade, plus player-manager Grant Murray, have also exited Stark's Park. Contract negotiations are continuing with goalkeeper Ross Laidlaw and defender Paul Watson.